schloss to schloss is the last in a series of three videos, which punctuate time spent living and working in three separate castles in southern Germany intermittently during the years of 2012-2014. The individual works refer to the situated-ness of place and ‘place’ as a entity once moved through. schloss to schloss, 2014, HD video, 7’25 minutes, color and audio. The audio track of schloss to schloss is an improvisation between French composer Nicolas Mondon (on prepared piano) and Danielle Adair (unscripted text/ voice) recorded on June 2014 at Akademie Schloss Solitude, Stuttgart, Germany, while both were fellows. The video was shot at Schloss Salem in Salem, Germany, during August 2014, while Danielle was a fellow at Schloss Spetzgart, Germany. Camera: Gunner Seitz. The work was exhibited at Castle Salem for the salem2salem exhibition, August-October 2014. 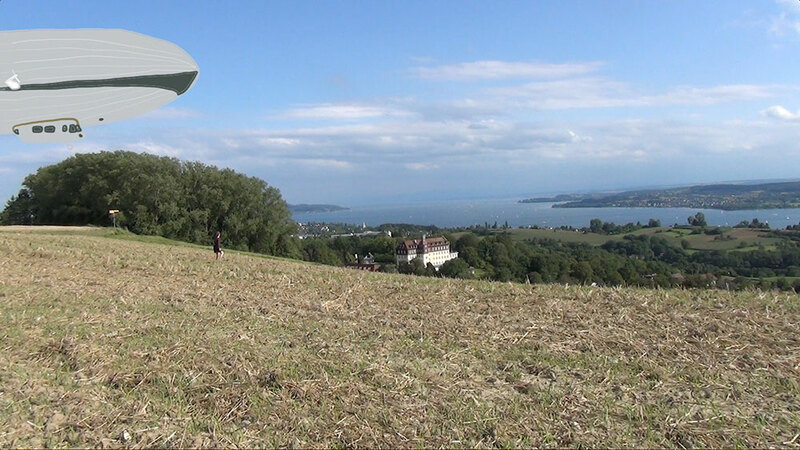 Bodensee, 2014, HD video, 1’12, color, no audio. Bodensee is inspired by the Zeppelin Museum in Friedrichshafen, Germany and the looming history of the Zeppelin airship in the Bodensee (Lake Constance) region of Germany. The castle featured is the residence Schloss Spetzgart in the nearby Überlingen where Adair was a fellow in August 2014, and the work was first screened at the salem2salem fellows’ exhibition (August 2014). In the Backyard, 2012, HD video, 5’53, color and audio. The words of In the Backyard are composed from Mark Strand’s poem “The Delirium Waltz” and David Lynch’s song “Crazy Clown Time,” with names replaced by those of artists and writers living in Los Angeles. The video was shot on site while beginning a residency at Akademie Schloss Solitude in Stuttgart, Germany in August 2012 and was first exhibited for the Casual Dancing show, organized by Bianca D’Amico and Greg Curtis at Elephant Art Space, Los Angeles (September 2012).